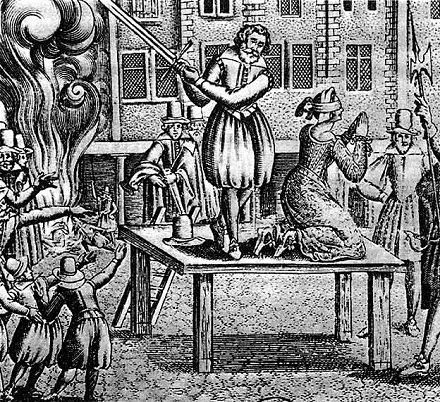 On this date in 1617, Italian noblewoman Eleonora Galigai was beheaded in Paris for witchcraft. Continuing the French crown’s glorious tradition of importing dubious Italians in the train of a Medici, Eleonora (also known as Leonora or Dianora) shipped over from Tuscany with her mistress Marie de’ Medici when the latter was dynastically married off to Henri IV. 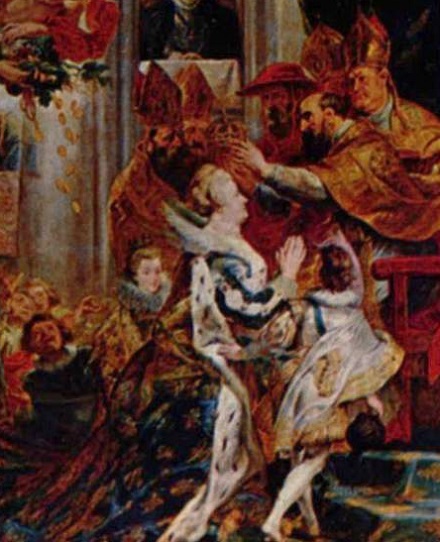 Like many in its time it was a marriage of convenience: Henri brought the kingdom — and Marie the money. 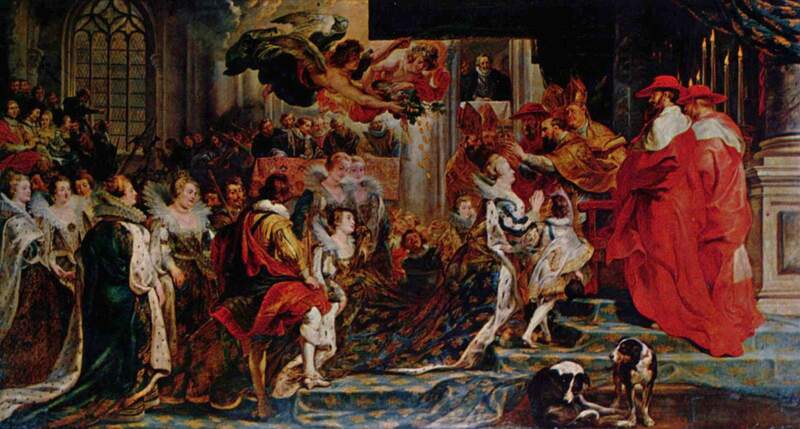 Detail view (click for the full panoramic panel) of Peter Paul Rubens‘s Coronation of Marie de’ Medici in [the Basilica of] St. Denis, part of a cycle of Marie de’ Medici paintings Rubens produced on the queen’s commission beginning in 1622. The coronation depicted above occurred on May 13, 1610 after ten quarrelsome years of marriage, and it was noteworthy timing (some thought suspicious timing) because her husband was assassinated the very next day, leaving Marie to rule France in the stead of her eight-year-old firsborn Louis XIII. To the boundless irritation of France’s native optimates, the import queen now bestowed an incommensurate favor on her own people, and were the French nobility to draw up their bill of particulars for us the very first name might be Eleonora Galigai’s husband. This character, Concino Concini by name, was the quick-witted son of a Florentine notary who had hustled his way into that same nuptial entourage. Marrying Eleonora, who was one of Marie’s favorites, put him squarely in the limelight among the regal expats; indeed it was he who had the honor of informing Marie of her late husband’s murder with the cold words “L’hanno ammazzato”: they killed him. Now (runs an English traveler’s epistle), Marie’s “Countenance came to shine so strongly upon him, that he became her only Confident and Favourite, insomuch that she made him Marquis of Ancre, one of the twelve Mareschals of France, Governor of Normandy; and conferr’d divers other Honours and Offices of Trust upon him.” He lived with his wife in splendor at the Louvre, both of them in the constant orbit of the queen whom they dominated. Haughty, insolent, low-born, foreign, and possibly complicit in regicide, D’Ancre was widely loathed in France; certainly he had few greater enemies than the growing young king, who would already have been disposed to chafe under his mother’s regency. In Louis’s eyes, this adventurer-marquis was both emblem of his mother’s misrule and (as Marshal of France) a substantive roadblock to his own power. 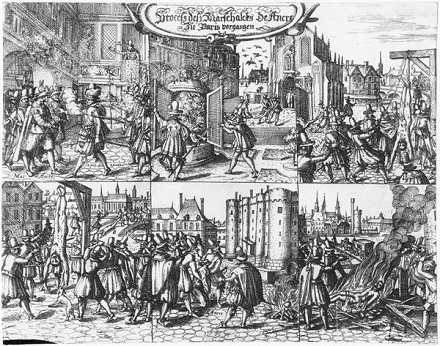 At last in 1617 — not yet 15 years of age — Louis seized his own realm* by having D’Ancre ambushed crossing in front of the Louvre and murdered by palace guards. Afterwards, a crowd long hostile to the noxious favorite brutally vented its rage on his naked corpse, gleefully shouting at Eleonora those words Concino had made so notorious: l’hanno ammazzato! They were really baying for her blood, too. With France in hand and public opinion at his back — “I cannot represent to the king one thousandth part of joy of all these people who are exalting him to heaven for having delivered the earth from this miserable burden,” one toady reported; “I can’t tell you in what execration this public pest was held” — Louis’s party began purging the remaining dregs of his mother’s regency. ** They soon shut up Eleonora in the Bastille, and had her charged as a sorceress. * This coup was naturally big news in England as well; there’s evidence of a now-lost play about it within weeks of D’Ancre’s murder. ** The eminence grise himself, Cardinal Richelieu, first attained the summit of the state as a loyal aide to Marie and Concino. Briefly banished from Paris in the wake of Louis’s coup, Richelieu bided his time and won his way back into the confidence of the young king with whom he was to become so closely identified. Maria de Medici was not all bad, just stupid.. I do not believe she -or her entourage- had anything to do with Henri IV’s murder as the King had far too many enemies. Although Maria was a bad mother because none of her children even liked her she was a pacifist and kept France out of the many wars. As her husband had altready plans to join the 30 Years’War , bringing more misery to Europe. Apart from her pacifism Marie was a fool, not evil. I can not say that of her entourage, however.